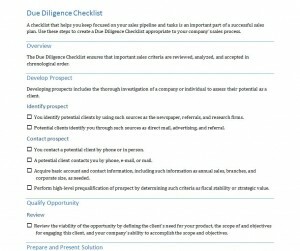 The Due Diligence Process Checklist is used by a company to create a checklist to make sure they have all the documents they need to review, analyze, and keep in alphabetical order important sales criteria. That way the company can put their focus on the sales process. A company that is not prepared for a due diligence process can cause delays which can cause a prospective buyers to lose confidence in the deal. That why it is important to be organized and ready for a due diligence by using the checklist. To use the Due Diligence Process Checklist the first step you will want to take is to add a company logo where it reads in a large, bold and black text “replace with LOGO”. Then you will want to save the file for future use. Underneath that you can add the company name and the title. You will also want to add the version of the checklist, the date the check list was done and the presenter’s name. The second thing to do is customize the checklist that best fits the company’s sales process. Then you will want start marking a check or an x on each task as you complete them, so that you can keep track of what has been done and what still needs to be done. This template is easy to use and free to download on this page. On the close form section you will want to type in the resources that were used for a project and who was the person that was in charge at the time the project was in progress. Then you want to type in the tasks that needed to be completed for that project on the Responsibilities section. On the same checklist you will also want to type in the date the project was completed and what the tasks entailed. You may want to add notes that are relevant to the project. The Due Diligence Process Checklist is intended for the purpose of gathering a checklist of completed tasks to enable you to have a successful sales plan for the purpose of attracting a potential vendor or business partner.